Oh my. Cheesy, saucy, meaty goodness all wrapped up in individual cupcake shaped packages is almost more than I could hope for, and yet here it is, for only 5 Weight Watchers SmartPoints per “cupcake.” I’ve seen different variations of these Lasagna Wonton Cupcakes on various blogs and recipe web sites and I couldn’t wait to put my own spin on it. 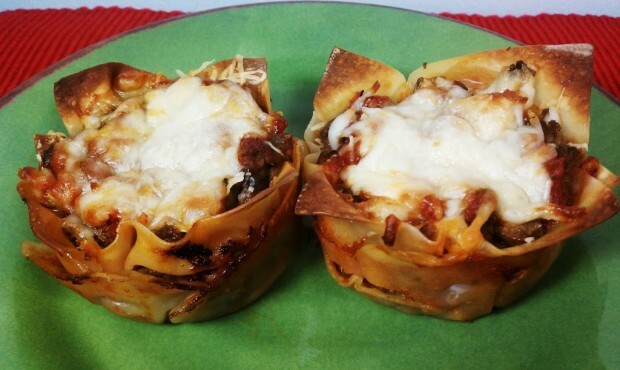 These little lasagnas are packed full of flavor and are much faster and easier to make than traditional lasagna. 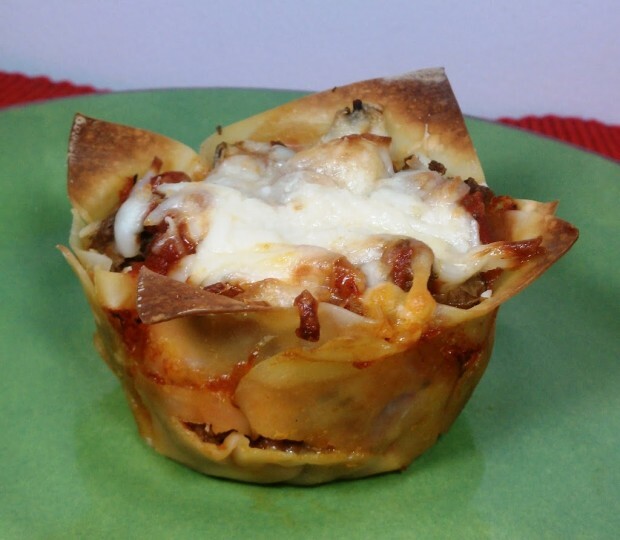 When people say “good things come in small packages” I’m pretty sure these Lasagna Wonton Cupcakes are what they are talking about. In a sauté pan or large skillet over medium-high heat, add the ground beef and Italian seasoning and brown beef, breaking it up with a spoon. Add mushrooms and continue to cook, stirring occasionally, for a few minutes until mushrooms are browned as well. Push a wonton wrapper into the bottom of each of the eight sprayed cups in the muffin tin. Using about half of the ricotta, spoon evenly into the wonton wrappers. Follow by spooning some of the meat/mushroom mixture into each cup (using about half the total mixture) and then splitting ½ cup of the sauce between each cup. Sprinkle about half the mozzarella and half the Parmesan evenly over the top of each cup. Press another wonton wrapper on top and repeat the layering steps with the remaining ingredients. Just made these tonight- YUM! Two “cupcakes” satisfied me just fine with a green salad on the side. Looking forward to having these for leftovers tomorrow! I made these last night for dinner and they were amazing!! Huge hut with the whole family. The recipe has been added to the “definite keeper” pile! Thanks for posting! Great idea! it’s so hard to guess with the regular pan lasagna. Well, at least for me, I love lasagna so I usually go overboard. These are perfect it takes the guess-timation out, and who wouldn’t want lasagna at just 4p+?!? Also, for another 4 p+ I can enjoy garlic bread and still have a p+ friendly dinner and maybe a little dessert! KJ – I know NOTHING about SFT, but I’m glad to hear these are adaptable! Lauren & Christina – So glad you liked them!! I have a ton of wonton wrappers left too. I just saw a recipe the other day to make them into baked chips so I might try that. I made these tonight and I actually was able to lighten them up even more! I added chopped spinach to the “ricotta”. I used strained cottage cheese instead since cottage cheese was cheaper and easier to use up. I also subbed zucchini for mushroom and added some chopped onion too. Oh, and I used jennie-o sweet italian sausage instead of ground beef. I also used 1 oz of parm and 3 oz of mozzarella instead of what’s in the recipe. Lastly, I had so much meat and cheese that I made 12 cupcakes instead of 8. All in all, I ended up with 3 p+ per cupcake or 6 for two. Thanks lindsay, I’m on a cupcake kick! These were delicious! Even my husband loved them! Do you think I could assemble them the night before and then bake them after work, or would they get to soggy while sitting? I think you could probably assemble them the night before. If you try it let me know how it works out! I have assembled the night before and it worked wonderfully. Mine are in the oven right now… I’m very nervous about getting them out of the muffin tin. /praying! Can’t wait to try them. Thanks for the great recipe ideas. I’m not sure what p+ or SFT means, but I love lasagna, so I HAVE to try these! Haha, P+ and SFT are Weight Watchers plans, but you definitely don’t have to know that to enjoy these. Hope you like them! Another less-than-bright question: what size muffin tin are we discussing, since I’ve seen at least three sizes? The one I have in my kitchen has 12 cups, each holding 1/2c. (measured the amount of water it took to fill a cup). I used standard sized muffin tins. I know they make mini muffin, standard muffin and jumbo muffin tins and I just use the normal ones. Made these last night! My husband has requested every meal be made into “cupcakes” for the rest of the week. Lol! Thank you for the awesome blog. Just tried these, and they’re a winner IMO. I did substitute pizza sauce for the pasta sauce, since I find most pre-made pasta sauces overly sweetened for my taste. I did wind up with enough meat/mushroom mix for a double batch, so went ahead and made the double batch (had plenty of cheeses and wrappers). I think I’ll use a little more cheese and maybe add garlic next time. You are so cool! Thanks for making this significant resource for those of us who want to watch our weight (and lose some, too!). The best parts about your website are a) the recipes are good for a working woman’s lifestyle and b) my husband might actually eat most of this stuff! Just made these for dinner and they were delicious! I used ground turkey instead of beef and added green peppers since I’m not a mushroom girl. Two cupcakes was perfect for a nice 8 pt dinner… This recipe is definitely a keeper! Thanks Lauren, glad you liked them! I made these tonite and loved them. My 8 yr old daughter gobbled up 3 of them and asked me to make them again. Thank you and keep up the great low point recipes! All your “cupcakes” look so good. Do you know if they freeze well? I’ve never frozen them myself but I have heard from many readers that they freeze great! I’m going to make my own vegetarian version of this today! I made these last night and they were a huge hit!! Can’t wait to try the cheeseburger cupcakes tonight. Thanks so much, Emily!! Emilybites do you have the nutritional information on these? Has anyone tried using frozen puff pastry instead of the wonton wrappers? Has anyone made these, baked them and then froze them? I am trying to find ideas for foods to prep and freeze ahead for a reception next month. Have to travel to the location and won’t have access to a fully stocked kitchen. I haven’t personally frozen them but I’ve heard from many readers that they freeze and reheat well. Hope that helps! LOVED the Lasagna Cupcakes last night!! This is such a savory lasagna with superb meaty, cheesy goodness and perfect portion control. 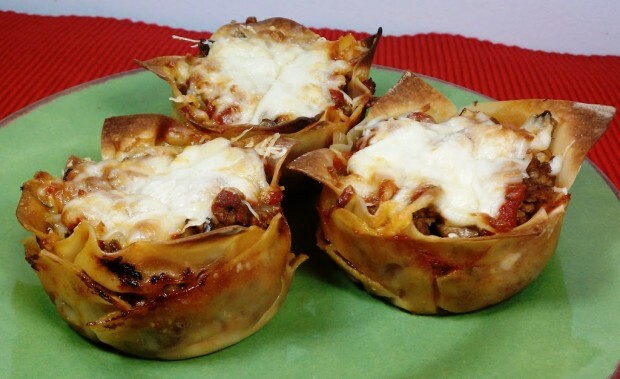 Lasagna is one of those foods where I will over indulge – not with cupcakes!! The most amazing thing was that I didn’t even miss that there weren’t any noodles in this lasagana – the soft wontons mimiked the noodle perfectly!! Tonight we try Cheesecake Stuffed Strawberries! Isn’t it great how the wontons mimic noodles in this? This was the recipe that kicked off my wonton cupcake craze. So glad they were a big hit, Phyllis! I brought a lasagna cupcake to work today for lunch, didn’t have time to heat it up, so sat at my desk and ate it cold. OMG, OMG, OMG it is FANTASTIC – this will make a perfect yummy to make for lunches!! I’m so happy you found me too!! As always, thank you for your thoughtful comments. I eat leftovers of all my “cupcake” recipes cold sometimes too, just because. Glad to know I’m not the only one who likes that! I’m going to make these tonight for dinner for some friends and my husband, what can I serve as a side dish that would go well with this? Maybe grilled veggies…? or bread? I ended up making the cupcake lasagna last night and I made half with just veggies (green pepper, onion, mushroom and tomato) and half with meat! They were amazing! And my husband loved them, which is hard to get him to eat ANYTHING new! Especially something healthy. So thank you for that! And I didn’t even need a side dish, but I did make the cheesecake filled strawberries for dessert…. Also a hit! Your website is now on my bookmark toolbar! It will definitely be my go-to website for healthy recipes! I’m so glad I found you =). LOVE IT!!!!! This is my first recipe I have tried from your blog, they were amazing. My husband thought they were so cute too. I just went to the market to get ingredients for several more recipes. So glad I found you. Thanks! I’m glad you found me too and that you and your husband both loved this recipe. Let me know what else you make! Yup! I have never personally frozen my wonton cupcake recipes but I have had dozens of readers report back that they’ve successfully done so and it turned out great. I’ve been cooking my way through your site for the past week and so far have loved absolutely everything but this one by far has been my favorite. It was a huge hit for the whole family and absolutely delicious!! Hi! I recently found your website and love it! Stupid question re: the lasagna cupcakes. The 4 oz of red fat mozzarella cheese. Is that 4 oz as in 1/2 cup using a measuring cup or 4 oz using a scale to weigh it? I’m just trying really hard to stick to the WW points values. Thanks! 4 oz by weight, which is equal to about 1 cup. Hope that helps! I know you’ve a million positive comments but I just wanted to add mine! I found you on Pinterest and made these tonight, as everyone has said, they were AMAZING! I can’t wait to try your other cupcakes, thanks so much!! Happy to hear you loved them! Made the taco cupcakes last night and the lasagna cupcakes today. You are a genius. Thank you for sharing these delightful little treats. I recently had weight loss surgery and these are te closest to “normal food” I have had! Thanks again! These are heaven. We have these at least once a week! Thanks so much for all your creative food recipes! Hm, I’m not sure how you got that. The recipe makes 8 cupcakes and each of them are 4 P+ so if you choose to eat two for a serving it would be more than that! I just made these last night and they were wonderful! Today I will try the zucchini parmesan rounds. I LOVE your recipes and the idea of using the won ton wrappers. I do have a question, though – is there a reason why you didn’t, or why I shouldn’t next time just add the pasta sauce to the meat/mushroom mixture rather than layering it separately? Thanks and Happy 4th! Emily, you are becoming famous in the WW world. Springfield, IL loves your recipes. Mentioned in our weekly meetings. Thank you! we had these for the first (and definitely NOT last) time tonight! My husband and son (14) both inhaled them and I enjoyed them as well! Emily, these were delicious! I have a family of 4, and put 2 “cupcakes” on each plate. DH looked at me like, where’s the rest of my food? Good thing I doubled the recipe. He ate 5 of them! LOL! I did serve a salad and a piece of garlic bread too. Emily: I don’t eat beef (or pork or lamb) and I also don’t mix dairy and poultry, so I wouldn’t substitute ground chicken breast or ground turkey breast in this recipe, so here’s my question: suppose I were to leave out the meat altogether. Would everything still hold up the same way? And do you think I’d have to use less sauce if I cut out the meat component? Thanks in advance! I brought “cupcakes” to our family reunion…even the pickiest of the kids loved them. Thank you for sharing your wonderful ideas! These are the best. This is the first recipe I have tried off your blog, but I will definately be trying more. YUM! These are delish! Great new twist on plain old lazagna dish. I loved these. Cooks quicker too. Such a great recipe. Thanks for sharing. If I froze them how would I reheat them? Is there a big difference between egg roll wrappers and wonton wrappers? I have egg roll wrappers and wondered if I could use those. I have made these multiple times and each time I enjoy them as much, if not more, than the last. Thank you so much for the great recipes. Question EMily!! what size is your Muffin Tin? 🙂 those look like a nice size! please let me know they look delicious and can’t wait to make them! I made these tonight…what a hit! I did onions, garlic, and 99% ff ground turkey. Added a little of the sauce to the turkey to keep it moist. And followed the rest exactly as written. These wontons are the cleverest food ‘invention’ I have come across. Perfect portions and yummy and so versatile. Even my dad who is anti health food loved it. I made all cheese ones for my niece and nephew and their picky butts loved it too. Thanks Emily! SOOOOOOO good. We LOVED these. I used ground chicken and they were so awesome. Whoa!!!!!! I just took these out of the oven. One word, dragged out. And Mr. Meat and Potatoes over there is making moaning noises while eating 2. Just made these for the first time and they were AWESOME! I subbed shredded chicken for the beef and threw some spinach in the sauce but otherwise followed your measurements. What a great way to control portions! BONUS: I didn’t destroy my kitchen the way I usually do when making lasagna. Next time I’m making extra and freezing for lunches. Thanks so much! Emily… you’ve got me addicted to your site!!!! Just a thought, how about cabbage roll “cupcakes”. If anybody could do it, I’m sure it would be you! You’re recipes are awesome! Love these. So, I am making carne asada tomorrow and didn’t want to make beef two nights in a row, so I changed these a bit. I made them with 1.25 lbs ground turkey, and added 6 small red and yellow peppers that I pureed in my small ninja bowl, along with 2 small cloves of garlic at the time that I added the mushrooms. Also, because I increased the meat, I bought an 8oz pack of mushrooms and used the whole container. With the changes, the recipe made 18 cupcakes. Thanks again for all of your hard work! Made these tonight, they were very good. A bit time consuming to make, but then again so is regular lasagna. Will definitely make them again! Hi Emily! I LOVE your website and have tried a lot of your recipes, but I am just now venturing into the “cupcake” recipes and I wanted to clarify (this is probably a stupid question) we are using a standard cupcake tin for these right?? Not the bigger muffin tins? I figured it was the smaller ones since they are called “cupcakes” in all your recipes, but your actual instructions usually say muffin tin so I had to check!! Thank you so much, can’t wait to try them and report back! Will these hold ok if you put them together the night before and cook them the following afternoon ? Once again, another homerun with the wonton cupcakes. These were so good! I NEVER would have thought to use wonton skins for anything like you make Emily. Thank you. I am cutting out all grains so even though the wontons only contain a small amount of wheat flour, I want to eliminate 100%. Do you have any suggestions for what else I can use or if they will work with the ingredients put into the tin w/o them? I just want you to know that I adore your recipes. I have lost 70.6 pounds on WW by just changing the way I eat for the most part. I have done very little with exercise. Your cupcake recipes are really satisfying and help me with portion control. I love them. I love lasagna and so does my boyfriend, but I pretty much eliminated most carbs. We enjoy the wonton wraps and don’t feel deprived. Thank you! Thanks Suzy, that makes my day. CONGRATULATIONS on your amazing weight loss! That’s so inspiring! I so appreciate your sweet comment and I’m thrilled you’re enjoying the recipes. Thanks for commenting! I should say – I eliminated most pasta – not most carbs…I don’t agree with cutting out whole food groups. I am obsessed with these! Sooo good. I love all your cupcake recipes–perfect portion control. Thanks for the great recipes!! So happy you love them, Lucia! I tried to make these and used two eggroll wrappers (my supermarket only had eggroll or springroll wrappers). They did not look like what you have pictured….How do you get the wrappers to completely encase the lasagna mxture…mine slopped all over. Other than that, the family loved them. Can these be made ahead and frozen then heated as needed?